On Wednesday, Salalah Airport became the first regional airport in the Middle East with a five-star ranking. The award was given At the Skytrax 2019 World Awards, which was held at the London Convention and Exhibition Center. Muscat: Salalah Airport achieves a 5-Star Regional Airport Rating and wins “Best Regional Airport Award”, ranking Fourth worldwide. Sheikh Ayman bin Ahmed Al Hosni, Chief Executive Officer of Oman Airports, received the award on behalf of Oman airports, he was accompanied by Salim bin Awad Al Yafie, Deputy CEO of Salalah Airport. The Skytrax Awards are one of the world's leading standards in the travel industry and are awarded to both airports and airlines. This international classification adds to the achievements and titles obtained by the airport since its official operation in November 2015. Commenting on this new achievement for Oman's airports, Al Hosni said: "Salalah Airport's achievement of this rating is a confirmation of the level of care that we and our strategic partners have towards our airport users, it also shows our continued interest in following up on their comments regarding the services provided at salalah airport, or any other Oman airport.I congratulate the Salalah airport staff, the entire Oman Airports family and the Sultanate of Oman on this significant rating. “I would also like to congratulate the Ministry of Transport and Communications, represented by the Technical Committee overseeing the airport projects, who have spared no effort in planning and supervising the execution of these giant Omani buildings in the best possible manner and with the best specifications. I also wish to congratulate and thank the Salalah Airport family for this achievement which came only as a result of their dedication and professionalism,” Al Hosni said. Al Yafie congratulated the employees of Salalah Airport and the strategic partners who are doing everything in their power to ensure that the procedures run smoothly and provide services to every traveler from the moment they arrive at the airport. The total number of passengers traveling through Salalah Airport, including direct transits, reached 123,973 passengers last January, compared to 118,800 passengers during the same period last year, recording an increase of 4.4 percent. The number of flights passing through the airport as at the end of January stood at 986 flights compared to 935 flights during the same period last year, with a rise of 5.5 percent. International flights through Salalah Airport stood at 412 last January compared to 355 flights during the same period last year, with an increase of 16.1 percent. Those flights generated a total number of 48,791 passengers compared to 43,192 passengers the previous year, with an increase of 13 percent. Domestic flights through Salalah Airport reached 574 with 75,182 passengers by the end of last January. 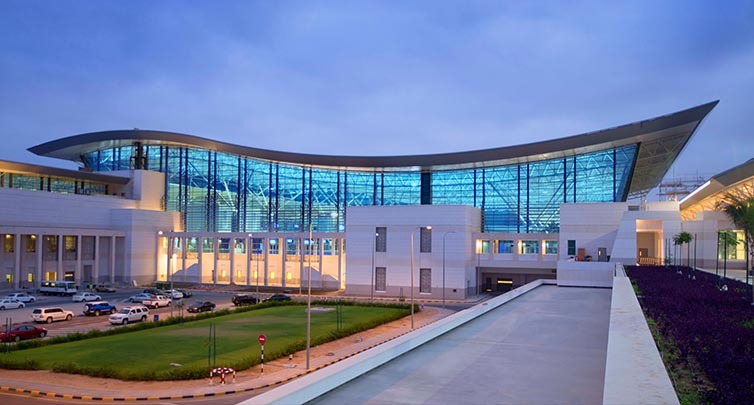 Salalah Airport features a passenger terminal with a capacity of about two million passengers a year, and a runway that is four kilometers long and 75 meters width, giving it the ability to handle modern aircrafts. The airport has a state-of-the-art navigation system and an instrument landing system designed as per international standards. It also includes a 57-metre-high air traffic control (ATC) tower and 27 new buildings, including a building for air observers equipped with the most advanced technologies, an IT center, baggage handling system (BHS) and 3 luggage conveyors for both domestic and international airlines, in addition to a VIP lounge and parking spaces for up to 2200 vehicles. The airport offers high-quality services including retail outlets, restaurants and other service facilities equipped with the latest technologies that serve the traveler from arrival at the airport terminal through to boarding the aircraft (29 elevators, 13 escalators, and 8 bridges that connect the gates directly to the aircraft), in addition to 30 check-in counters and 10 departure gates.